Bibliometrics is the analysis of research literature based on citations. It can be used to show the value of research to your institution and funding bodies, to identify areas of research strength and weakness, to identify top journals and identify emerging areas of research. It can be used to locate potential collaborators or competitors. It is also used in rankings such as Times World University Rankings and QS rankings and by some panels in the REF so whatever your views on metrics it is worth finding out what is recorded about you. Subject coverage does vary – arts and humanities has traditionally not been included in citation indices for example. Scopus and Scival from Elsevier currently have the contract to provide citation information for the Research Excellence Framework and the Times Higher and QS rankings. Scopus is an article database while Scival is a tool which uses the data from Scopus to allow comparison between universities and researchers along with other uses such as finding collaborators and looking at funding. You will need your university password to access Scopus off campus while Scival can only be used on campus. Web of Science was the first database to offer citation searching as well as keyword searching. Originally by the Insitute of Scientific Information this suite of tools is now owned by Clarivate Analytics. The data from this produces the Impact Factor, one of the best known metrics, which is available in Journal Citation Reports. Incites is an analytical tool which uses the Web of Science Data to provide similar information to Scival. You will need your university username and password to access Web of Science off Campus. To use Journal Citation Reports and Incites you will need to register from a campus PC. As Google Scholar is created without much human intervention the data is not as reliable as the two systems above and is not used in rankings etc. However, for subjects which are not covered by Scopus and WOS it can give some insight into who is citing you and can pick up citations to books and other non-journal material. If you create a Google Scholar Profile it will track citations for you. There is a piece of free software available - Harzing's Publish or Perish which can help you to pick up and analyse citations in Google Scholar. You may have heard of the h-index, developed by Jorge E Hirsch at UCSD. 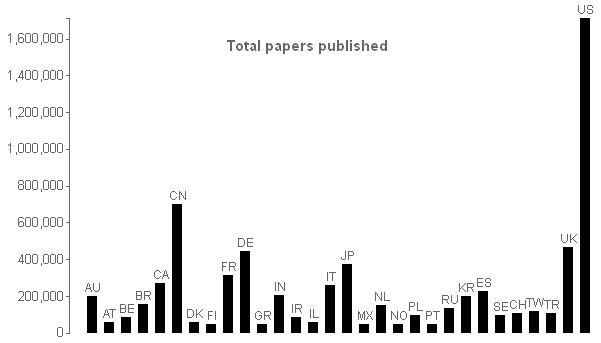 It attempts to measure both the productivity and impact of a researcher and is based on their most highly cited papers. A researcher has index h if h of their papers have at least h citations each, and their other papers have no more than h citations each. This formulation is intended to address the problems of other measures of citation count which can be skewed by large numbers of total publications or by an author being associated with a single highly influential paper. The H index can be found in Scopus, Web of Science and via Google Scholar profiles though you will probably find that results differ since they are based on different datasets - a problem with metrics! Analysis of coverage in SciVal for adepartment or research group: what percentage of publication outputs are being counted? Managing Scival entities: groups of researchers need to be created manually in Scival for analysis. We will co-ordinate these to avoid duplicated effort across the university. Advise on the limitations and issues relating to evaluation with metrics. Provide information on journal metrics such as impact factor. Requests for any of these services should be sent to iss-research@swansea.ac.uk. We have limited staff resources. If requested to create large entities, for example, we may require administrative support. We will be running this as a pilot service during 2018 to assess demand and may have to limit the number of requests we accept. The research community should develop a more sophisticated and nuanced approach to the contribution and limitations of quantitative indicators. At an institutional level HEI leaders should develop a clear statement of principles on their approach to research management and assessment, including the role of quantitative indicators. Research managers and administrators should champion these principles and the use of responsible metrics within their institution. HR managers and recruitment or promotion panels in HEIs should be explicit about the criteria used for academic appointment and promotion decisions. Individual researchers should be mindful of the limitations of particular indicators in the way they present their own CVs and evaluate the work of colleagues. The UK research system should take full advantage of ORCID as its preferred system of unique identifiers. ORCID IDs should be mandatory for all researchers in the next REF. Swansea University has endorsed the San Francisco Declaration on Research Assessment (DORA). Compile evidence of research / impact either on a personal or a project level. Altmetrics are a measure of attention (not quality), which could also be said of traditional citation counts, so should be contextualized where possible. Install the Altmetric bookmarklet for information about articles you find when browsing. This explains the coloured bagel you will see. Some journals now provide their own altmetric information on their site, for example, Nature, Frontiers in Psychology. PLOS apply their own set of metrics explained here. Scopus use PlumX metrics. You can see these within the Scopus database. You can view altmetrics for your work in Impact Story if you link it to your ORCID.